​The Royal Tea is a full service birthday party program offered at All-Starz Dance Academy. 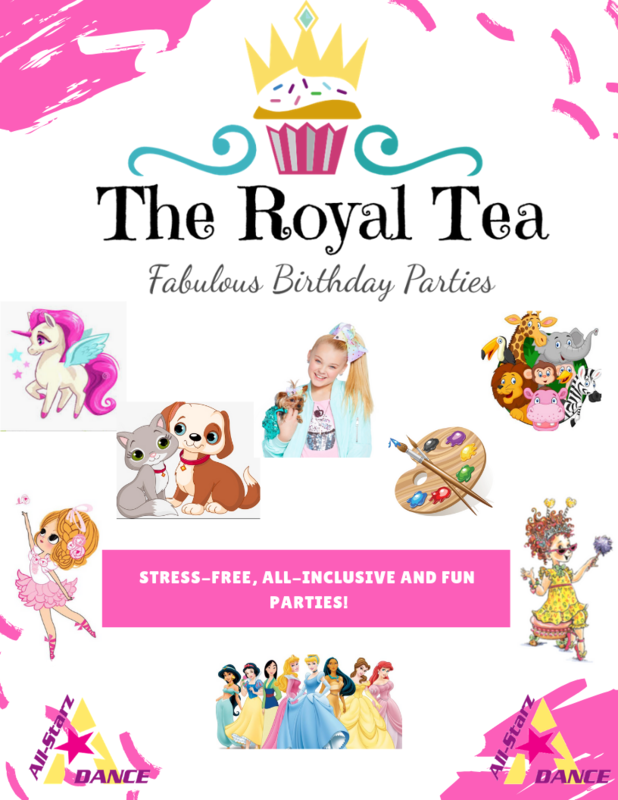 Royal Tea parties were created with 3-7 year old girls in mind and with the goal to create a fun and memorable experience with low stress for the parent. All parties include cupcakes, a drink, papergoods/decor, an activity/ craft, a party hostess, and all set-up and clean-up. Literally, just show up with the birthday girl! We offer set packages but are able to give quotes on customized events as well. We would love the opportunity to share a Royal Tea event with you! Email us allstarzdance@gmail.com to request a date or to get more information. Current themes: Fancy Nancy, Jojo Siwa, Rainbows and Unicorns, Beautiful Ballerina, Princess, Artsy Crafty, Purrfect Parwty, and Zoorific!